Taco night happens once a week in my house, this is my favorite, taco recipe made from scratch! We make it with beef or turkey, it’s delicious both ways. Made in the slow cooker using my homemade taco seasoning, this makes enough meat for several nights so we usually have tacos one night and I’ll use the rest of the meat for leftovers over tostadas, taco salads or to freeze for another night. The slow cooker and pressure cooker are great for making taco meat, especially when using lean ground beef like I use here because the slow low heat makes them come out very tender. Can also be made with ground turkey or chicken or swap the taco shells for lettuce wraps to make them low-carb. We love taco nights in my home SO much that I created an entire chapter in my new cookbook dedicated to tacos! Everything from traditional beef tacos to more creative tacos like Aji Tuna Poke Jicama Tacos, Indian inspired Cauliflower-Potato Tacos with Lime-Cilantro Chutney (my favorite! ), Slow Cooker Salsa Verde Chicken Taquitos, Korean Tacos, just to name a few! 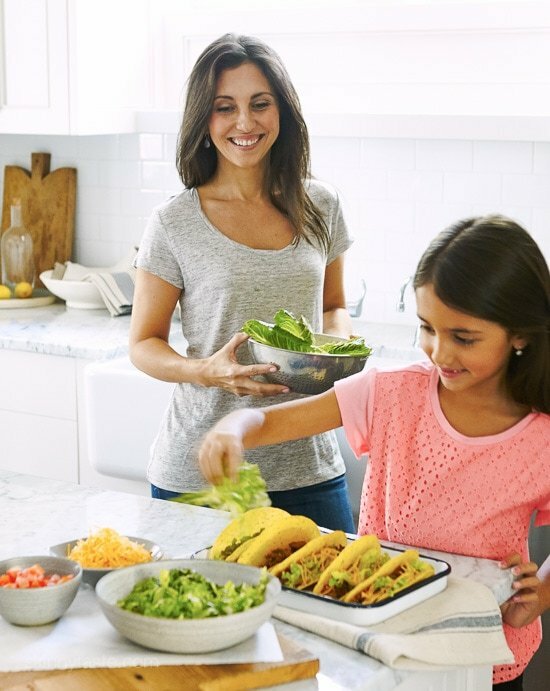 Out of all my taco recipes, these are the most kid-friendly – the tacos my 6 year old daughter Madison loves! 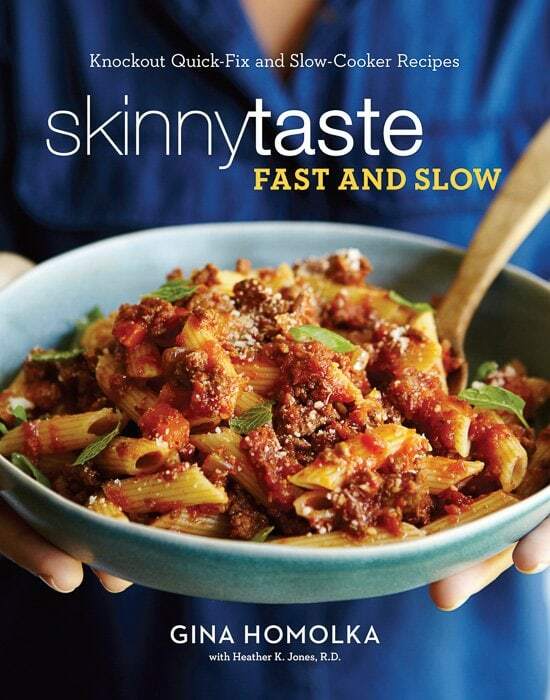 This recipe is a preview of what you’ll find in my second cookbook, Skinnytaste Fast and Slow: Knockout Quick-Fix and Slow Cooker Recipes 140 nutritious, flavor-packed, figure-friendly recipes—60 for the slow cooker and 80 that cook in 30-minutes or less!—so you can get a great homemade meal on the table any night of the week. 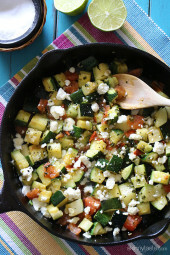 Each recipe includes nutritional information from registered dietitian Heather K Jones. Many dishes are vegetarian, gluten-free, and freezer-friendly, and these are called out with helpful icons. Even more photos than the first book, with 120 color beautiful photographs taken by Helene DuJardin. To make prep even more efficient, chop your veggies while the meat is cooking (instead of ahead of time). After your veggies are chopped (and meat is still cooking), combine your dry spices in a small bowl. When possible, I like to combine dry spices instead of adding them one by one because it helps ensure spices are evenly distributed. Brown the beef in a large nonstick skillet over high heat, breaking it into smaller pieces as it cooks. When no longer pink add 2 teaspoons of the cumin along with the remaining dry spices, onion, bell pepper and garlic, stir and cook 2 to 3 minutes until soft, then transfer to the slow cooker along with 1/2 cup water, bay leaf and tomato sauce. Cover and cook on high 3 hours or low 6 to 8. Discard the bay leaf and add the remaining teaspoon of cumin. 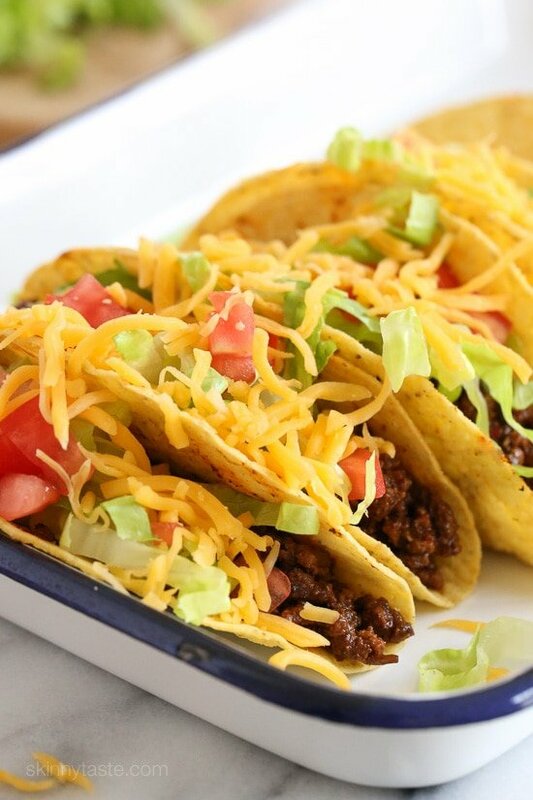 Heat the taco shells according to the directions, then assemble placing 1/4 cup beef in each shell, topped with lettuce, 1 tablespoon cheese and tomato. Press saute, add the beef and cook breaking it into smaller pieces as it cooks. When no longer pink add 2 teaspoons of the cumin along with the remaining dry spices, onion, bell pepper and garlic, stir and cook 2 to 3 minutes until soft. Add 1/2 cup water, bay leaf and tomato sauce. Cover and cook on high pressure 20 minutes; natural release. Discard the bay leaf and add the remaining teaspoon of cumin. I make this all the time! Tonight I was out of tomato sauce so added salsa verde instead. So delicious!! Hi! 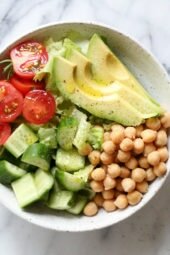 I’ve made this recipe before and its amazing! I’m just wondering if the nutrition facts include the Taco Shells? Just trying to figure out how to make it keto. I dont follow keto but I’ve used this taco meat stuff a roasted pablano pepper and then topped it with cheese and put it under the broiler for 3 minutes. It was delicious. I’m a huge fan of all of Gina’s recipes. 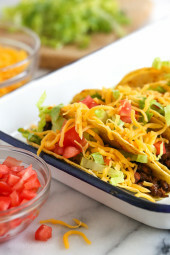 Tacos are my absolutel favorite – which is why I can’t believe I didn’t try this recipe sooner! Best. Homemade. Tacos. Ever. Absolutely the best tacos I have ever made. Really yummy. Followed the recipe exactly for the instsnt pot! Do you drain the fat after cooking the ground beef? You can if you want, but not too necessary with very lean beef. Is this recipe spicy? I haven’t made it yet but was just asking because my 4 year old doesnt like spicy foods. Do you have the calories/fat etc for just the meat mixture without the taco shells? Would like to make this into a salad instead but use your taco meat recipe. Thanks in advance. I put the meat part in the WW recipe calculator and it came out to 2 freestyle points per 1/4 cup. There is not enough good things I can say about this recipe, it is wonderful, I will never, ever use packaged taco seasoning again. I have shared this recipe with so many friends, and they all love it. This is probably one of my favs from the site. I made mine on the stove. Best tacos I’ve ever made. I made my meat in the Instant Pot. The flavor of the taco meat was delicious. But, it came out really soupy. I cooked it exactly per the instructions. The only difference is I didn’t use 93% lean ground beef; I think it was 15%. And I didn’t drain the fat after browning it (not east to drain the fat in the Instant Pot). I guess that was the difference, I don’t know. I had to transfer my meat to the stovetop for an additional 15 minutes to evaporate most of the liquid. Sometimes when I make it it’s liquidy. I add a slurry with a little water and cornstartch and summer it for a few minutes and it thickens up nicely. I made this recipe tonight since I needed something quick and easy. I made it on the stovetop and also used 1% ground turkey. Tacos are always a big hit, but using the spices instead of the packages of taco seasoning really made this recipe stand out! I will definitely make it again! Thanks Gina! I’m sorry if someone else has asked and I missed this, but if I want to freeze 1/2 after cooking, what would the best way be to reheat from frozen? Love this blog! I’m making this now and am thinking I made a mistake by draining the beef. It’s really dry in the crockpot. I just added some more sauce and water, so hopefully that takes care of it! what would the calories be if we used lettuce vs taco shells? We’re having this tomorrow so I made it today. I find that taco meats taste even better the next day. This is DELISH!! Like someone else said, it’s totally reminiscent of the “lunch lady tacos” from school, but better. I love how tender the ground beef is. The taco seasoning in this beats the store bought kind for sure. I’m glad I found this recipe. Super excited to have this for dinner tomorrow. Thanks for sharing! 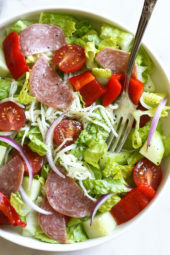 If I was making for a larger group, and wanted to add a 3rd pound of meat, would I also add an extra half of other ingredients (water and spices)? And would I have to add extra time?